Please help me thank delbert for renewing his WWKC Membership for 2018! Thanks for your continued support! Thanks for your continued support, Delbert. Thank you for your continuing support, delbert . 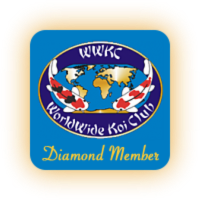 Please help me thank q2005 for upgrading his WWKC Membership to a Lifetime Pro! Thank you for all your support! You can find Anthony at Koi Enterprise so visit them soon! Thank you so much for your support Anthony! support and good luck with your breeding venture! Thank you for your support FRK. Please help me thank StevenE for renewing his WWKC Membership for 2018! Thanks for your continued support! Thank you for your continued support StevenE. Help me welcome our newest Koiphen member and he wasted no time in becoming our newest WWKC Annual Hobbyist member, lkstaack! Thank you so much for your support and I hope you enjoy the forum! lkstaack. Thank you so much for your support! Thank you so much Charles for your continued support.